I might make this into a series and if I do then this would count as retail confessions number one. The premise behind it is a lazy collection of photos to summarise recent acquisitions. It's a shameless confession of what I have bought and what I am into right now. I always post about clothes and most of my new beauty bits but this is more of a collective "haul" type post to proudly boast about other "stuff" that can't necessarily be worn. Be warned...some items are a little random. But I always think that random is quite good so here goes! I saw these on the Urban Outfitters website - they have since sold out because they were £3 each in the sale - and was somehow attracted to them. I told you I was into statement jewels! These are total lobe stretches from ASOS - Link! - and feature a rose gold (yawn!) and black stone detailing. They are clip ons which immediately took me down memory lane where I pictured a 8 year old me trying on my grandmothers earrings and feeling very grown up and sophisticated. 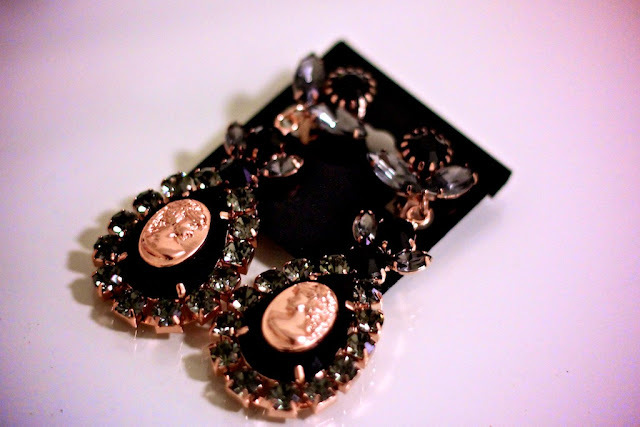 I plan on wearing these with a very dull outfit to add some interest. I bought a night light! Don't worry, I don't use it in the bedroom - it's in my girly room and currently resting on the dresser. Who knows how long that battery will last but it's innocence and cuteness was well worth the trip to Urban Outfitters in Edinburgh. They do have it on the website - Link! - but am almost 100% sure that eBay will offer up some cheaper versions that are probably the same quality. Now the books....for some reason I have moved over to reading actual books and have neglected my Kindle. This started when I paid a visit to Takashimaya in Dubai a month or so ago. It's a must-see if you are ever into Dubai and you want to experience the best bookshop ever created. I don't know how a shop can be so inspiring but it is and I literally want to buy hundreds of books whenever I visit. These three are the latest. The Perks of Being a Wallflower has been completed. It will take you about a day to read but is an amazing and touching story that I am sure so many of you have already read. What dies in summer sounds horrendously morbid and gets love/hate reviews. Now is Good, like Perks, is also a film and is also pretty morbid. It was previously called Before I die but presumably Hollywood thought that was too much of a Debbie Downer. Either way, I am looking forward to reading the rest of this stack. First of all I follow the advice of my good friend Sula who claims that items purchased in duty free don't count. It's a parallel world where your bank card is still charged but where you don't feel it. That's the only way to explain the below. The YSL lipstick is pretty standard - just a Rouge Volupte in number 1 that I kept thinking about and so waited till I travelled to buy. The fragrance was hauled because I tried a sample of this in Sephora and fell in love. Admittedly this happens very frequently with fragrances and Versace isn't really my scene as a brand but Crystal Noir is lovely. It's creamy and dark but the white florals keep it fresh. I highly recommend putting your preconceptions of Donatella aside and giving this a try. Let it dry down and I promise you will be sniffing all day. Now, the bracelet. I do like a bit of Hermes wrist action and when I spotted this bracelet in the concession in Terminal 3, Dubai I did recklessly exclaim "I'll take it". The enamel is the colour of Sephora OPI's Metro-Chic for crying out loud. So I picked it up and have only taken it off for showers and this photo. Expect to get bored of seeing it. What's your latest must-have purchase? ooh good on you! Duty free? It has to be taken advantage of. Airports are like a twilight zone I swear :) I am just lucky that I rarely fly though T3 or T5 at Heathrow...damage would surely be done there. I love those mugs, and obviously the Hermes cuff :) love how you described the color as Sephora by OPi "Metro Chic" in bracelet form. Genius. Do it! It's a great book - very easy to read and the end is a surprise that made me gasp/feel very sad. I LOVE IT ALL! i really like the lipstick though, what a gorgeous shade! The mugs are hilarious but not sure what some of the more 'mature members of my family would say! I am obsessed with that bunny night light! I need it in my life! I LOVE those mugs!!! I want the; in my kitchen, but they're sold our you say?? I hope you turn this into a feature. I really liked this post. Do turn this into a series, I love seeing what people have been buying. :) The bracelet looks lovly, as does the lippy. nice haul, I saw those mugs at urban outfitters the other day too, but between my new bag, tops, cardigans and jewelry stand I had to pass. I die for sales! Yes, do the series, great idea! I need to read, 'Confessions of a Wallflower'. I read 'Before I Die' a couple of years ago,it really got me. I teared up for days after whenever I thought of it. I too love the bracelet!! Latest retail confession that, like you, totally bought on a whim. Just about to leave the shops and the boy wants to stop in and have a quick look at watches at Walker & Hall Jewellers. 10 minutes later I emerge with the most gorgeous Gucci bracelet. Whoops! Ok, I love the mugs....They are right up my street and they look like you would get (as they say in Ireland)"a good drop of tea" in them, if you know what I mean. I am always on the hunt for new books and authors so I have noted you 3 last purchases to research. As always a lovely post. 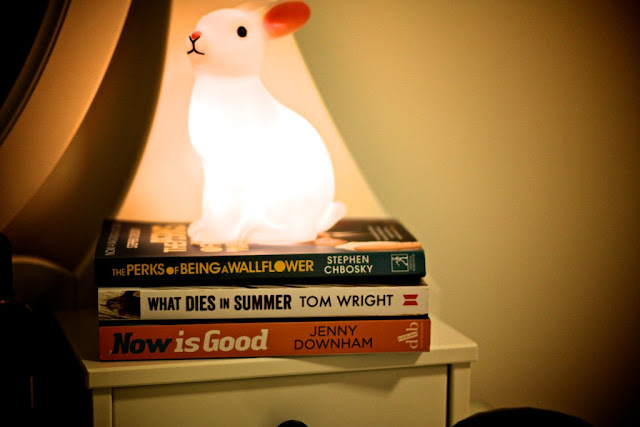 love love love the little rabbit lamp...too cute!!! I basically want everything. Those cups are hilarious and that Hermes Clic-Clac... oh my! Love the bracelet and I was on the look out for some new books so let me know how you get on with the other two. The bracelet is lovely .. clean and classic. Currently reading the Orchardist, by Amanda Coplin which is quite a nice read and reminds me of Steinbeck. Before I Die (Now Is Good) is absolutely amazing. I sobbed my heart out at the end but I absolutely loved it. I didn't want it to end and I was thoroughly swept away by the stories. Jenny Downham is great and I really enjoyed the other book I read by her. Really hoping the movie can live up to my high expectations because I adored the book. If you like this maybe try Forbidden by Tabitha Suzuma. Taboo subject but fantastic read. Definately worth it. LOVE the bracelet! And that night light is so cute lol. It was only when I was switching off last night that I remembered the Jenny Downham book, Before I Die/ Now is good. I read it last year. Its a good read, and I enjoyed it from what I remember. ooooh you just reminded me, i have that rouge volupté somewhere hidden in my stash and i haven't used it in ages! i shall wear it this autumn/winter again. also, i love that perfume (and bright crystal) need to decide what perfume i want for xmas and now you're making me hesitate! Gorgeous bracelet! 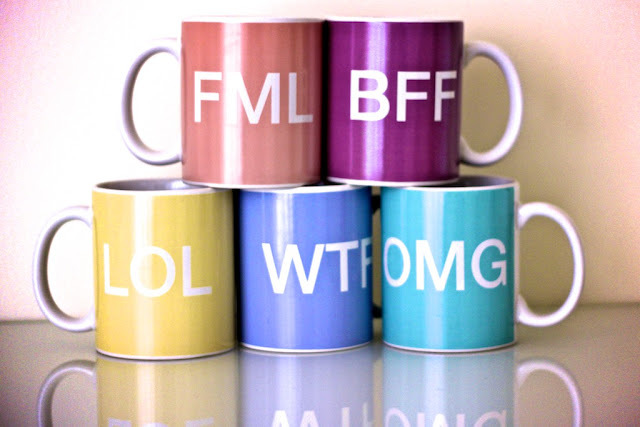 And those mugs are such fun! I really want a Hermes bracelet, or maybe even a belt. 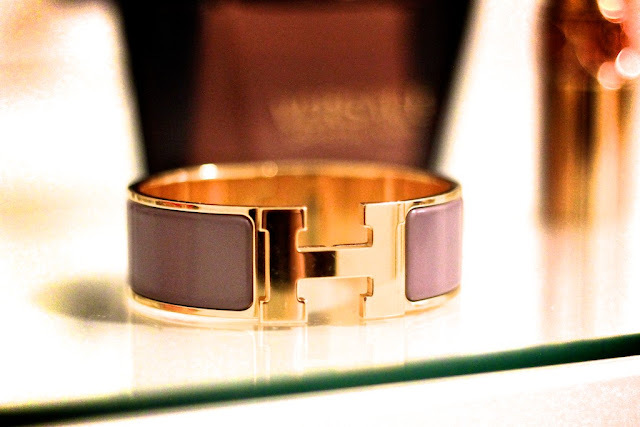 How you manage to spot concessions on a Hermes bracelet is beyond me! Why dont I have such luck? Your blog posts always make me chuckle. I love it when people ask what FML means. teehee. Took me ages to read The Perks of Being a Wallflower. For some reason I could only manage tiny little bits of it at a time. I'm going to give the film a whirl though. Love those mugs! & the gorgeous Hermes bracelet. Would love to wear that with the polish I've just blogged about! I just wanted to say THANK YOU for a post you did almost a year ago on an App called Get Running (Couch to 5k) I downloaded it as soon as I read your post and this kicked off my motivation to start getting active again. Since then, I've lost almost 20 lbs and clothes are much more fun! I secretly booked a visit to London with the boy just so I can check out the prada saffiano lux tote in grey.....oops!!! so nice blog nice idea . 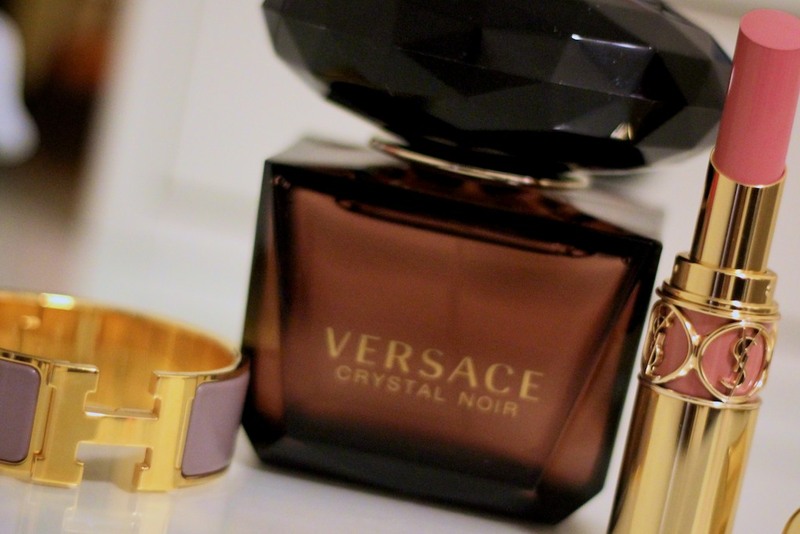 i had the versace one a long time ago - loved it! I like this blog and as for as storing the items is concerned I think these must be placed at accessible area if you require to take it out more frequently. I just love the lipstick color and it was amusing to see the WTF mug, I would like to buy this one for drinking coffee, I like this blog. system information, setups and even more.Under left corner of the home page installing kodi on pc you will need to establish things up manually.